see my reply below,there were more or less the same number of heavy duty programs installed on both platforms and probably about 150 more fonts installed on the Macs.the only difference was the PC rooms were not as well supervised so vandalism may have been a factor in their early demise. An education environment is difficult in that everyone wants to load up at the same time so dump it on the local drive. Just network those things you need to. Windows can be configured with restricted access users that are not allowed to install software and the other thing you can do is make the software read only and give each user a separate account that way thy can only screw themselves up. It's not difficult to do but does require some IT knowledge and it sounds like you didn't have it available. In education, more or less everything has to be networked as everyone submits work via computer. You have to have it all sewn up tight because students are always trying to play games etc . As for standalones, you have to have a special dispensation to do a machine that has a generic login so you can work on it off the network, ( but even then they still had a network log in so people could print and back up their work and so they could be backed up and re-imaged). .
All users had restricted use , no way you can allow students to install anything on pc's as the the whole thing would be chaos within a day :-) the software was read only and each user had a separate account. The thing is you have a cohort who cannot be trusted who don't know what the hell they are doing in most cases and a good number who spend their time trying to hack into the network. I would have preferred to just have a local network with a desktop client to connect to the net and printing,with a large backup drive in my room which is what i did in the 1990s, but it was not allowed after 2000 . What I really want to see is the pricing for the early access version, LOL. If you want a MAC for free, install Ubuntu Linux and KDE Plasma for the desktop. You have yourself a MAC+. Ubuntu supports all the latest PC hardware. How about adding the shift + Z function as an added control feature in the new TRS 2019 so that the user can display and monitor the frame rates of the game when in driver mode, a feature that is used in other product train simulators available on the market ? Absolutely! That would be really helpful - on full-screen and windowed, please. WHAT???? This won't run on my Commodore 64??? OMG!!! TO put the anti mac posts here in perspective,, i installed a 8gb rx580 on my 2010 mac pro and it runs sp3 at 60 fps on ultra settings on highly detailed routes , no doubt a newer machine could do better with a decent card, now,I know it would get much higher frame rates in windows taking advantage of direct x , but if you install window on the Mac using boot camp , you can have the best of both worlds. 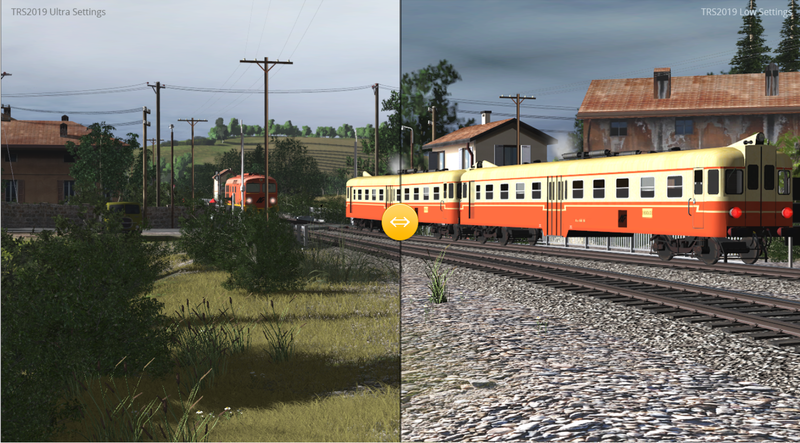 if trainz is eventually ever optimized for metal .mac performance would be much better. Are you saying that TRS19, or any other version of Trainz, will run better on a Bootcamp partition running Windows than on a Mac partition running Mac OS X? If TRS19 were loaded onto a Bootcamp partition running Windows, e.g., Windows 8.1, could it run TurfX? You should ( theoretically) get much better results running Trainz in windows on a bootcamp partition , as you would with most games that are primarily made for PC . Trainz doesn't support Metal so you aren't getting the benefit of that technology when you install it on the MAC. Apple are pushing their own tech just as windows does, direct x is microsoft tech , so its absent on the Mac and also to add insult to injury there's been a distinct lack of development of open gl in the past few years as Apple try to push developers to integrate Metal in their games . if you had Tane on bootcamp the improvement would be especially noticeable if you were using 4k screens with everything maxed out. I've had issues with trainz on PC ( especially 2012 ) and generally find it more reliable on the mac ( if less responsive ) but for a driving experience the PC is definitely the best performer . Lamentável jogo totalmente cheio de bugs gráficos não carregam por completo jogo travando a todo o momento, como pode minha máquina (pc) roda Batleffield V , Fifa 19 no ultra e não roda este game , assinei um mês e estou arrependido caso não arrumem estes bugs desistirei até mesmo de comprar o jogo. Jogo muito caro para muitos erros. Perhaps wait until it is really released. It is still really beta at the moment. I purchased 2019 yesterday and installed it. It loaded fine and seems to be working pretty good. But I am having some problems. The biggest one is hesitation in the movement of the trains. I have been playing the Farming Simulator for years and it works great. No loading problems etc. Is there a setting that can cause this. I have downloaded the lastest NIVIDA drivers, etc. I hope I can get this fixed. The game was expensive and I would really like it work. Any ideas?